Are you looking for an easy slow cooker chicken recipe? Or Need to freshen up your slow cooker chicken recipes? 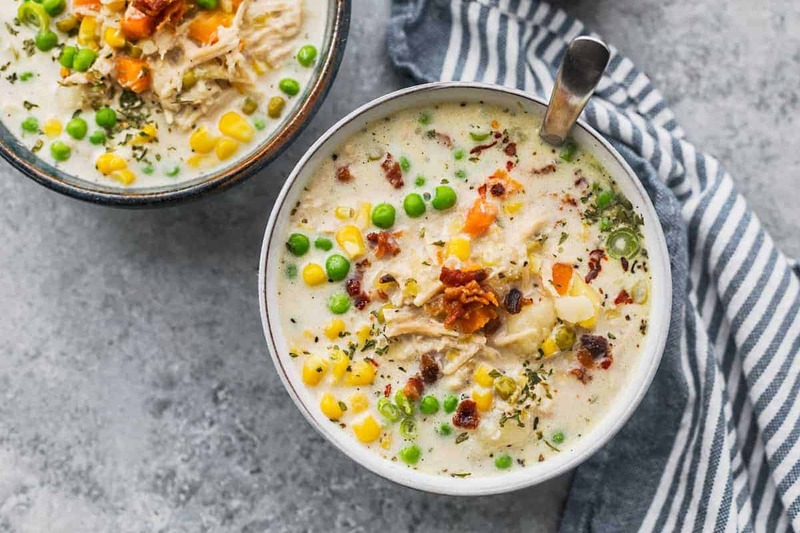 Try this creamy slow cooker chicken soup, with chicken pot pie flavors of corn, carrots, peas, potatoes and serve with green onions, crispy bacon and biscuits or rustic bread. 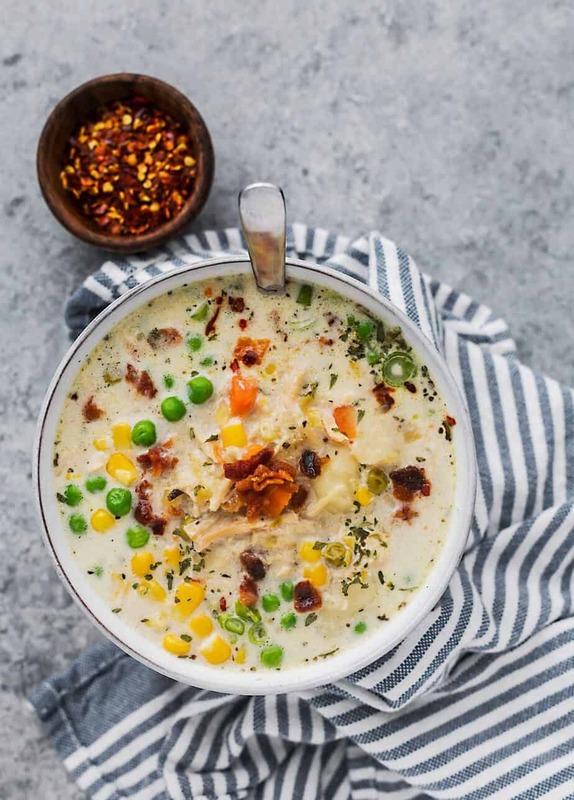 This classic chicken flavor is hearty and perfect to warm you up on one of these stormy nights. For this chicken pot pie recipe, I added some yukon potatoes and flour to thicken the liquid and skipped the condensed soup. Fresh poultry should be used within on or two days of purchase, or frozen immediately. Prepackaged poultry can be left in its package, with transparent wrapping intact, for refrigerator storage. If the wrapping is torn, transfer the poultry on a plate, and cover loosely with aluminum foil or waxed paper. Cooked poultry can be refrigerated for three or four days, wrapped and keep dry. You may also freeze for longer storage. Cooked poultry in broth or gravy should be refrigerated for only one or two days. Hope you’ll enjoy this chicken pot pie recipe. Heat butter in a large sauce pan over medium heat. Add onion, celery and cook until translucent, for about 2 minutes. Add garlic, keep stirring and cook for 1-2 more minutes or until fragrant but do not burn. Stir in the flour and whisk until lightly browned. Add chicken stock, milk and stir frequently until the sauce thickens. Put chicken into slow cooker and pour in the broth/sauce mixture. Stir in potatoes, poultry seasoning, garlic powder and cook on high heat for 3-4 hours or low for 5-6 hours. About 30 minutes - 1 hour prior serving, add frozen mixed vegetables and taste the broth. Season with salt/pepper if needed or according to your liking. Serve with chopped green onions, crispy bacon and rustic bread or biscuits. Yum! 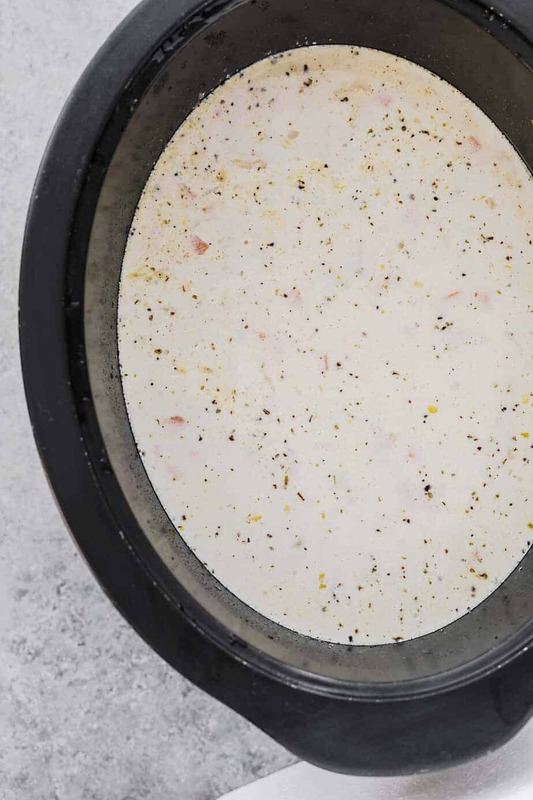 Love the idea of making pot pie as a simple slow cooker soup. 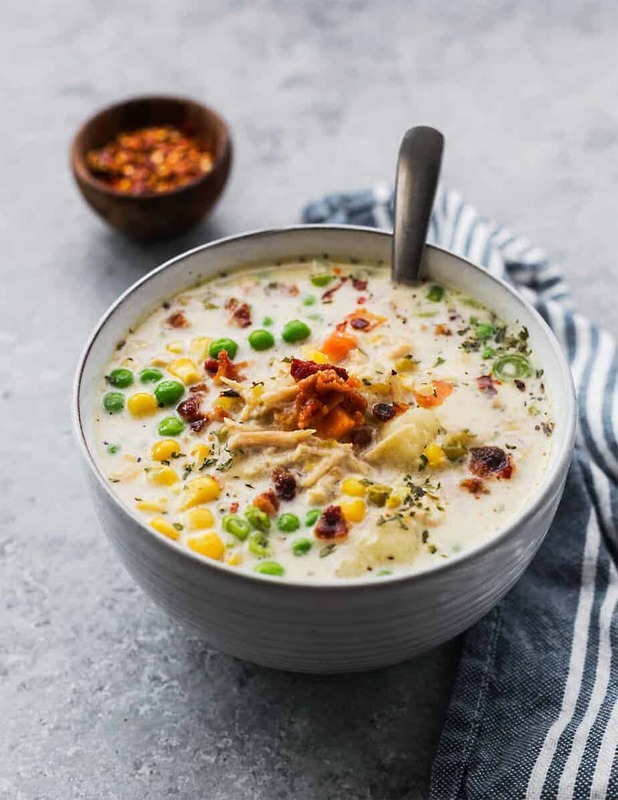 Love how you took a classic comfort food and amped it up to make it even more perfect for a cold winter’s day as a soup! Genius!! Amazing photos! I really loved pot pie as a kid so it’s nice to see it in soup form. Seems like it’d be perfect to have during the winter! Oh jeez, that looks INCREDIBLE!!! If not using rotisserie chicken and just regular breast, does it need to be precooked?? Looks delicious! Hi Olivia, I used raw (pre-cooked) whole chicken breasts. We just made this and the poultry seasoning kind of overpowered the flavor. May put less in next time. Otherwise it was very good! Thanks for sharing your thoughts! I’ll make sure to edit the recipe, ask readers to start with a small amount of poultry seasoning. This was very good. I used an entire rotisserie chicken. I only put in 1/2 of the garlic powder and that seemed to be enough. My kids gobbled this up. Thanks for sharing your feedback Erin! 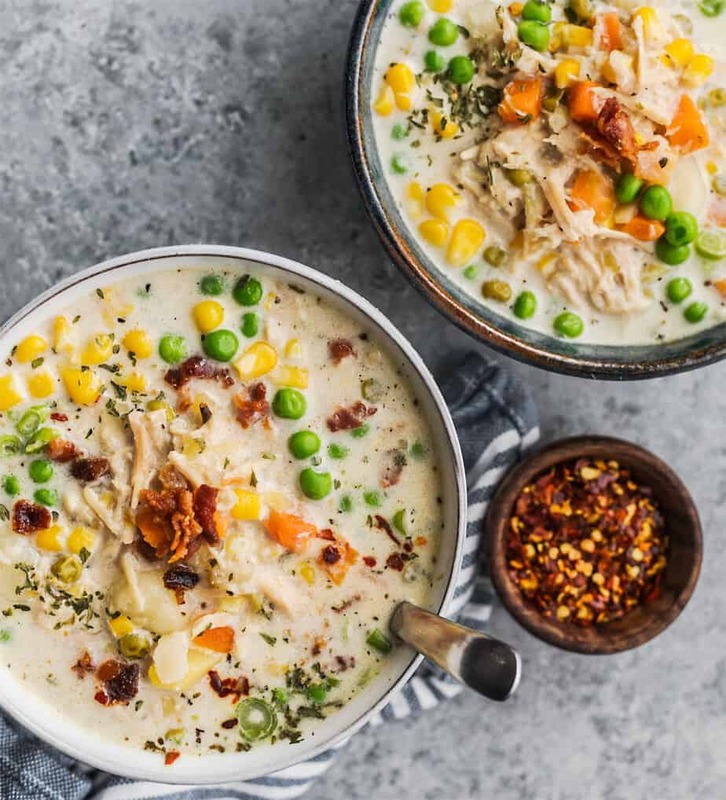 I am so glad to hear that you and your kids loved this slow cooker chicken pot pie soup recipe!